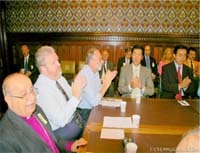 Following a Global Peace Festival held throughout the previous day at Imperial College in London, a meeting in the House of Commons discussed the Middle East Peace Initiative, a major project of the Universal Peace Federation. It was chaired by Dave Anderson MP, who had recently returned from a fact-finding tour of the region and met with local politicians and religious leaders. John Levy of the ‘Friends of Israel Education Trust’ spoke on the topic of 'The Israeli perspective on Middle East peace-making' and gave a strong defence of the right for Israel's historical ownership and its current right to exist in internationally recognised borders. He spoke of Israeli fears of terrorism and for its security in a small land surrounded by huge Arab populations. The fears of a people persecuted throughout history featured strongly in his presentation. After a question and answer session Dave Anderson MP, as chair, mentioned the role of the Israeli Labour Movement known as the Histadut which was performing a positive role in the search for peace by promoting the rights of Palestinian workers who work in Israel and lobbying the Government for preferential treatment to be given to Palestinian workers over those from other nations. Dr. Hyun Jin Preston Moon, Chairman of the Middle East Peace Initiative, pointed out that even his own life had been one of persecution and bitterness that was nothing to do with him but the family into which he had been born. He said he could have had the right to harbour great anger but had decided to let it go. “The Israeli - Palestinian conflict has a cycle of violence that will never stop because there are crimes committed on both sides. The practice of true love and one family under God is the only way to resolve the conflicts of the world. The meeting ended with a singing of ‘Happy birthday to you’ and ' For he's a jolly good fellow' for John Levy who had given up time on his 60th birthday to speak at this event. It was a good note on which to conclude the meeting.